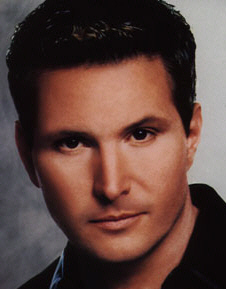 On my recent trip to Nashville to cover the 2004 CMA Fest/Fan Fair, I was fortunate to be able to get an exclusive interview with the always delightful and dynamic, Ty Herndon. He became an instant success in 1995 when his debut single, "What Mattered Most," shot straight to the top of the Billboard and R&R charts. The accolades and achievements have continued over the years and he has racked up numerous hits and a variety of industry awards. By the time he appeared to switch gears, and release the bluesy album, Steam, he already had three gold albums and three number one hits to his credit. Steam successfully combined the energy of his stage performances with the passion he is so easily able to convey on his albums but it wasn't the commercial success the label had hoped for so, after launching a Greatest Hits CD in 2002, Herndon and Epic Records parted ways. The following year he released a Christmas album on an independent label and then just seemed to drop out of site. I was eager to talk with him to find out where he has been and what he has been doing. As I anxiously watched the door of the coffee shop, I wondered if I would recognize him but the minute he hit the doorway, all the trepidation disappeared. Herndon was immediately identifiable by that characteristic "ear to ear, I'm so glad to see you" grin of his. Much to my delight, he recognized me too. You might think that isn't such a big deal but believe me, having an artist be able to call you by name, after not seeing you for more than two years, is remarkable when you consider the number of people they meet each year. That kind of recall speaks to the character and sincerity of a person. One of the first things I noticed about him was his cheerful attitude. He looked really good and seemed very happy in his skin. He was excited to be back in Nashville after returning from California, where he "went to clear his head and write." Herndon says, "I learned first hand that the business I love so much can spin you around and once you are caught up in the eye of that tornado, it's hard to come out unscathed." Well, he may have had a few spins but he certainly looks unscathed and he was eager to tell us about all the exciting things that are going on in his life and all the great projects he has been working on. One of his most gratifying endeavors these days is volunteering at the Vanderbilt Kennedy Center and working with special needs children. In May he was the celebrity host of the 2004 Waddell & Reed Financial Advisors Charity Golf Tournament which benefited the center. Herndon credits the children with keeping him grounded and on course. He related stories about several of the children and how they so effortlessly wrapped themselves around his heart and touched his soul. The irony for him is that he sees the children as the strong ones and he finds spending time with them to be extremely rewarding. We have heard from various sources that his love affair with the children is a mutual affection. They adore him, perhaps in part for his willingness to add an amazing number of stanzas to "Old McDonald Had A Farm." We are told that, on a good day, he can go from aardvark to zebra -- creating an animal to sing about for every letter in between. Herndon says, "To put it simply, these children have changed my life. What's so great about this school is you may have an autistic child, a Down Syndrome child, a slow learner child and then you have what we call the average, normal students and they are all mingled in together" he explains. "The school is from kindergarten to fifth grade and this is a perfect environment because these children are learning from each other; tolerance, humanity and passion." His face softens and he takes a moment to reflect and recall another story he wants to share, then continues, "I have observed a Down Syndrome or autistic child grow impatient with the average kid." He pauses, smiles again, then says, "The lessons being learned there are priceless gifts." He wants to tell me about his new music venture but he isn't allowed to disclose the particulars yet. He can tell me that he has been doing a lot of writing and that moving to the west coast was a good move for him. He says he realized he was burning out, creatively, and he had "lost himself and where he came from" somewhere along the way. So he went in search of himself and now he is back with a renewed passion for his career and his life. He also discovered a whole new enthusiasm for writing. He says he never took himself seriously as a songwriter until now. He is excited about the fact that he wrote all but one of the songs on the new album that he hopes to release soon. He is also working on a new Christmas album, refining the details of his upcoming tour, and working on a re-make of the old Elton John/Kiki Dee duet, "Don't Go Breakin' My Heart," with his friend Tanya Tucker for possible inclusion on the album. My final question for Herndon was, "If you could change anything in the music business, what would it be? His spontaneous reply was, "That everyone would be heard." The compassion in his voice, and the softness of his face as he responded, lead me to believe he wasn't only talking about music. He is on a mission; one soulful voice, hoping to make a difference in the world and I'm pretty sure he will.